My students are working on an awareness and social action campaign with the students from Reading, Ohio (teacher: Brian Page.) They are celebrating May DAy in a new way -- asking everyone to buy jewelry made by those rescued from human slavery and to wear it on that day. May Day: May all slaves be free one day but until then we will speak on their behalf. They have a blog, a Facebook page and more. Would you consider creating awareness next Monday and celebrate with them on May1st? We're looking for some more classrooms to join their voices to our blog at hopeforslaves.com a website we set up this week. A downloadable guide to share with parents.They will need to sign in with Twitter or Facebook to download the guide. It does mention the Digiteen project (one of our Flat Classroom projects) in the manual but truly, all we're doing with Flat Classroom and the growing body of projects being created by our certified teachers are transforming education. There are those that shake their heads wondering why teachers would create so many free or almost free projects while shunning the traditional software programs that have kept schools walled away from the world - it is because we want to interact with the world. How to use technology with ages 5-8. Here are some lovely easter-themed resources and interactive whiteboard resources. A collection of resources, lesson plans, and tools to use with those with an autism spectrum diagnosis. There are some great special needs resources from around the world on this website. Go to the quiet place (hat tip Angela Maiers.) some of you could be using this right now. My very smart friend, Jarrod Robinson, from down under, has a PE games app.He is a PE teacher using QR codes and cross disciplinary learning experiences like few I've ever seen. (Plus he's nice and funny too.) If you work with Physical Education, you'll want to check out what he's doing. Very proud of my dear friend Cheryl Oakes from Maine who is on the Official Google blog with her work with those with disabilities. Cheryl is an amazing woman who loves children. My youngest son has met her only once (in San Antonio at ISTE) and still calls her Aunt Cheryl. She has that effect on people. Great post. 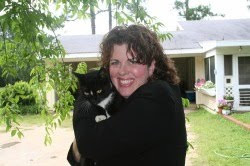 "One teacher who has taken advantage of the web as an educational tool is Cheryl Oakes, a resource room teacher in Wells, Maine. She’s also been able to tailor the vast resources available on the web to each student’s ability. This approach has proven invaluable for Cheryl’s students, in particular 16-year-old Morgan, whose learning disability makes it daunting to sort through search results to find those webpages that she can comfortably read. Cheryl taught Morgan how to use the Search by Reading Level feature on Google Search, which enables Morgan to focus only on those results that are most understandable to her. To address the difficulty Morgan faces with typing, Cheryl introduced her to Voice Search, so Morgan can speak her queries into the computer. Morgan is succeeding in high school, and just registered to take her first college course this summer." The students are talking about this - are you? On March 31 - earth hour day is the "largest environmental event in history." Can you switch off for an hour? Can your students? This is a great thing to do with your students but also to have as a writing prompt. Did you participate? Why or why not? What did you do with your hour? Here are lessonplans to share and use to discuss this. It is Saturday. But Earth Hour Day (31 March), the largest environmental event in history, reminds us that switching off can be a good thing. Make a stand in 2012 and teach students about climate issues – prepare them to take responsibility for change in the future with this hand-picked selection of lesson plans and activities. This lesson plan brings in cultural literacy using Cinderella's story. By comparing different versions of Cinderella, you can also discuss culture. I love this method of framing cultural literacy for the elementary age student. If you want to quickly add some great feeds to your google reader, here's a bundle of lovely edublogs (over 800 of them) you can pull into a folder. You could remove those that don't interest you after reading. You can use these to get started in Google reader. Google is really starting to get RSS so say experts. It is shown in the methods that Google is using to embed ads into RSS. I think the biggest thing is that I'd like to do this to at least differentiate my clean blog with all of those who scrape and take my blog content without credit. Great article on how Google is (finally) using RSS. "Google has filed for a patent with the US Patent and Trade Office (USPTO) for embedding advertisements into syndicated RSS and Atom feeds. There is a bug in twitter that some have uncovered. Sometimes people who are unfollowing you didn't unfollow you. Here Jeremiah Owyang explains what is happening. I know of a few unfollows that were upsetting to me and then later they swore they didn't. Of course, it could be true or not, but one of them was a family member who I know didn't unfollow me. Just be aware that thing is not all as it seems in Twitterville. This article in the Washington Post, I've seen several mentions by teachers. The slow reading movement is one that advocates really getting into a book and also becoming intimate with the "author" even to the point of memorization. It is about relaxing and getting into a book instead of rushing through a lot of them. "I have therefore joined the slow reading movement. Like the slow food movement, it is about more than just slowing down, though that is part of it. It is about an intimacy with authors; it is about paying attention, about caring, about rereading and savoring what we read. It is about finding the right pace. About pleasure more than efficiency. Slow reading is also about recovering old practices that have traditionally aided readers in paying attention — oral performance, annotation, exploring complex and difficult passages. It is about reading that generates ideas for writing, what Ralph Waldo Emerson called “creative reading.” And even memorization." I don't see the information on this study that says foreign language improves global competence but I think perhaps it is the interaction with the native speaker from another country that causes the improvement in global competence. It is time to start studying global collaborative projects and their impact on global competence. Another point is that this article says that "it has been proven that proficiency in speaking a second language increases overall academic achievement." Unfortunately this author has no citations or links to follow and learn about. Perhaps it is citing the original NEA article. I just think this author can do better although I'm intrigued by what it says. "According to a study by the National Education Association (NEA) in 2010, global competence stems from proficiency in a foreign language." One of my students, Merritt, has as her Freshman project, to work with reviewing books with our relationship with the Kindle Kids Corner. She's learning a lot. Here is a review of Catching Fire, the second in the Hunger Games series. Book reviews are a powerful way to engage students in book reviewers. You can apply to have your school be part of the Kindle Nation Daily program. Last week was a mess largely because the form we set up for teachers to share their information with us for the Eracism project was pulled down by Google with no warning. All of the data we collected to set up the voicethreads you now see at http://eracism.flatclassroomproject.org was lost with no hope of return. I contacted Google (is there such a thing) and found that the only way to get my file back was to publicly post on a a thread on the Google product forum. Talk about a security lapse! They are concerned I'm collecting private data and I have to publicly post the link to my spreadsheet to get it reviewed? According to Google terms of service, you're not to be collecting personal information using Google forms. This includes a userid, password, AND emails. This is odd because we've been using Google forms in this way for as long as I can remember but that is what they say. A bot looks for words like "userid" "password" and "email"
A bot looks for these words and can suspend your form. You get no warning. You get no way to get the data back. Another teacher has his work blocked for some strange reason and has lost his coursework. I followed the systems in place to get back the data. Meanwhile, although we've used Google forms quite a bit to collect data for our projects (for 5 years since Flat Classroom started) it looks like that we may have to look elsewhere. There is no method to communicate with Google employees and request review of a document. This is a problem and although no one is talking about it, we need to start. Every day we ask for parent permission. We ask for addresses, we ask for phone numbers, and we ask for emails. If Google will randomly scan our work and also will not define for us what constitutes "private information" then Google forms is NOT a suitable alternative for collecting information for schools. But then again, what is private? Just about everything we collect. Hoping to get some commenters to shed light on this in the comments below. Perhaps there is something I'm missing. Thanks. I can't in good faith recommend it and am moving to surveyshare and looking at Zoho forms' terms of service to see if they are better options for what we're doing. The needs of schools are unique and right now, Google is ignoring this one. I love this edutopia story about Heather Hanson and her students on the Rosebud Indian Reservation in South Dakota and their desire to tell the real story of their reservation. Kudos to Heather! This is what flattening the classroom is about: relevance, speaking out, connecting, and making a difference. Eric Sheninger shares notes from a presentation at ASCD about Global Competencies and the Common Core. Of course, there are many other resources that are connecting globally besides the Asia Society - iEarn, ePals, Global Schoolnet, and (of course) Flat Classroom Projects as well as sites like eTwinnings. Great read to frame the thoughts around global competence and common core. I look forward to being at Eric's school in October. Here, a school uses giant maps to help students understand distances. This is great. I also think Google maps and Google earth are great tools with benefits as well. Easter-themed lesson plans of all type including poetry, board games, and more. This made me smile. In a game show - copernicus and Galielo explain how they discovered and explained the movement of the earth around the sun. While this particular slideshow refers to slumdog millionaire, if you have your students watching a video or movie, download these slides and change it around to help your sudents critique a movie. Better file converter than zamzar. (Hat tip to Richard Byrne - free tech for teachers) because it doesn't require email. This week, as I teach my ninth grade computer fundamentals class about how to create a social media campaign, we are working to promote the sale of bracelets in the movement to end modern day slavery. Three years ago, my students participated in the Many Voices for Darfur project with other students around the world. I want my students to be social media mavens, hinges that can influence society by understanding the power of social media. But building awareness isn’t enough. I want them to know that they can act. I want to be a living lesson plan helping them learn about life itself. Like an explorer setting forth on a journey to an unknown country, I want to be the one in the crow’s nest spotting the land of their future profession or passion. I believe that every student has something that student does best. I want to be the one who helps the child who doesn’t test well see the beauty in the art she draws. I want to be the one who helps a young man with dyslexia learn how to download a book on his cell phone. I want to be the one who hugs a child when she gets accepted to college. I want to be the one who can hold it together even on a hectic day to show children that an adult can hold her temper, even when stressed. I want to help students from around the world travel electronically to a place of greater understanding that will benefit our world. I want to be a reason a child wants to come to school and engage. I want to connect kids to their future. If you’re one of those fine, hard working, intelligent, empathetic people... or even if you’re not but want to be that kind of person.Welcome. Welcome to a profession of great professionals. We are noble because we behave nobly. We expect a lot from each other and yes, we’re heartbroken when those among us break faith with the children in their care. However, we will never use that as an excuse to be anything less than excellent. To be or not to be... that is not a question for me. While any job can be used to serve mankind, perhaps no profession is more important to the future of this planet than that of teaching. It is a job rich in meaning and opportunity to make a difference. Why do you teach and struggle through a job that isn’t always easy? Why do you keep going? Why do you do it? Some may call us sappy but I call us in love with what we know our profession to be: noble. It is only as noble as we behave. It is time to remember our noble calling, teachers. Teacherpreneurs is what teachers must become in order to empower students and customize the classroom. Here, Michael Graffin, teacherpreneur, ponders what it means to him. Lots of STEM ideas in this gallery. I support Mano (posted in this blog post) because I know her work and she does great things but many great ideas are here. My friend Mano from ISTE is working to get some attention from HP for her K12 project. It is the only K12 project I see on the site and hasn't garnered enough votes. I'm all for K12 collaboration, so I'm liking her project and ask if you'll do the same. This is the pilot Kindergarten - 2nd grade project with more than 40 classrooms. It is a very exciting, wonderful project. I love the introductions that are happening. We will open this up to everyone in the fall. Stay tuned to my blog and the #flatclass hashtag for upcoming announcements. The stars were beautiful in Medicine Hat, Canada this past week. Stunning. But they were also educational. As Steve Dembo (@teach42) and James Hollis (@jameshollis) pointed their ipads and iphones at the sky, Starwalk was adding an overlay on the world that was remarkable. This is the kind of homework we should be giving. 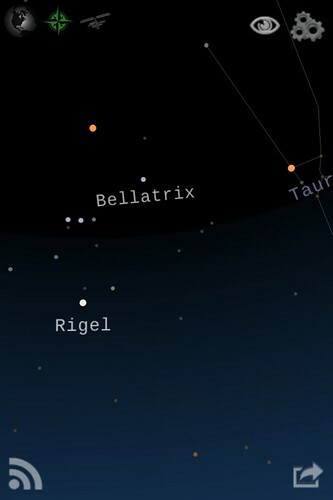 This incredible iphone app or ipad app, when pointed at the sky, determines the stars, planets, etc. that you're looking at and labels them for you. Everyone who looked at this app during the three days we were in Medicine Hat would suddenly forget the cold, gaze at the sky and their jaw would drop open. This is a great example of augmented reality (see a Simple Lesson in Augmented Reality.) Reality is being enhanced with apps and online tools and it is quite incredible that such an app can recognize stars and overlay meaning on top. Using the website "alternative to" I see only one good suggestion for Android, Google Sky Map, although I haven't tested that one. Teaching resources covering the different types of poetry. Great collection of lesson plans and information on Shakespeare. There are a lot of downloadables here for literature teachers. Excellent article about Mark Zuckerberg's growing up as a CEO. The demise of Britannica is being pontificated but I agree that it wasn't Wikipedia that killed it. I don't totally agree with this author in that the PC killed Britannica because it became our information portal through the Internet. Heading to speak at this conference this week in Canada- excited to do a smackdown on Friday with Richard Byrne (Free tech for teachers) that is going to be a highlight of my year, I think. Learning with Meaning: Dude, Can You Please Edit? I love this great point from Kyle Dunbar that is very true. Harnessing peer pressure for positive - this is a perfect example. I want to use this example in my upcoming book. "Dude, Can You Please Edit? This was shouted across the room at him in a none-too-patient voice from a friend across the room. It was clear that when Student X went to give reluctant writer Student Y some feedback in his wiki, the piece was filled with too many errors. It was after this across-the-room exchange that reluctant writer Student Y quietly asked Teacher Wiki where the spell check function was in the wiki tool. Quietly, surreptitiously, reluctant writer Student Y went back and began to revise and edit his piece. That quick exchange with his peer made more of an impression on him than repeated attempts by his teacher. And I question whether or not the scenario would have unfolded the same way if the students had just exchanged papers. Instead, this is a perfect example of what can happen when students are encouraged to write from the beginning in a digital format. 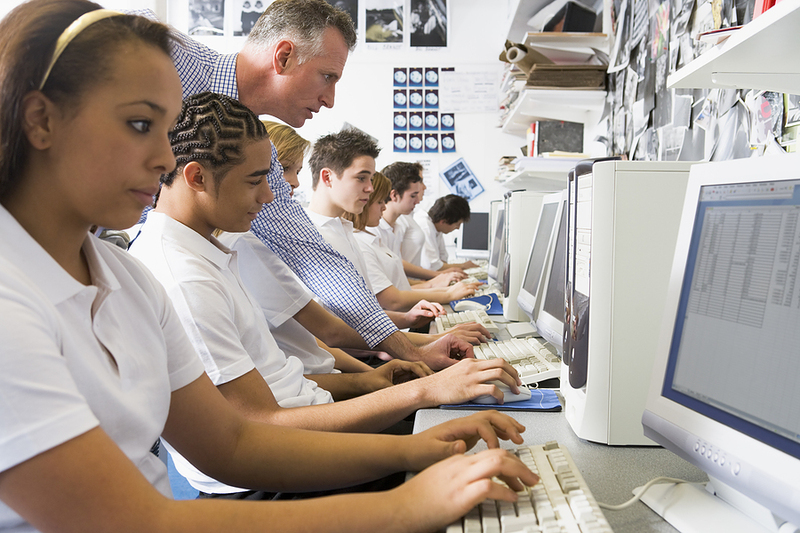 Editing and revising is so much easier in the digital format but, more importantly, when adolescents get feedback from their peers, they are much more interested in revising than when they get the same feedback from their teacher." Teachers who are collaborating are joining this group to share their resources. 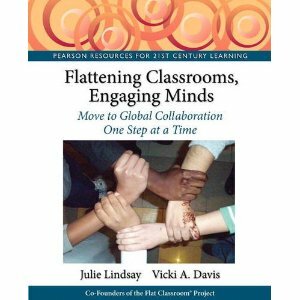 As mentioned in the book, research relating to global collaboration is being tagged flatclassroom_research -- if you want to go back and categorize your bookmarks to help share and you use diigo - open your library on their website, go on the right side and look at advanced view. You can then select all the boxes or filter for certain tags and then modify tags and add tags to them. How to use Google Docs with EDmodo. You can link your Docs account and use it within your groups. Here is how. An incredible set of Google forms that you can use in your classroom. One tip - never collect emails or you violate Google's terms of service and can lose access to the spreadsheet like we did with our Eracism project last week. 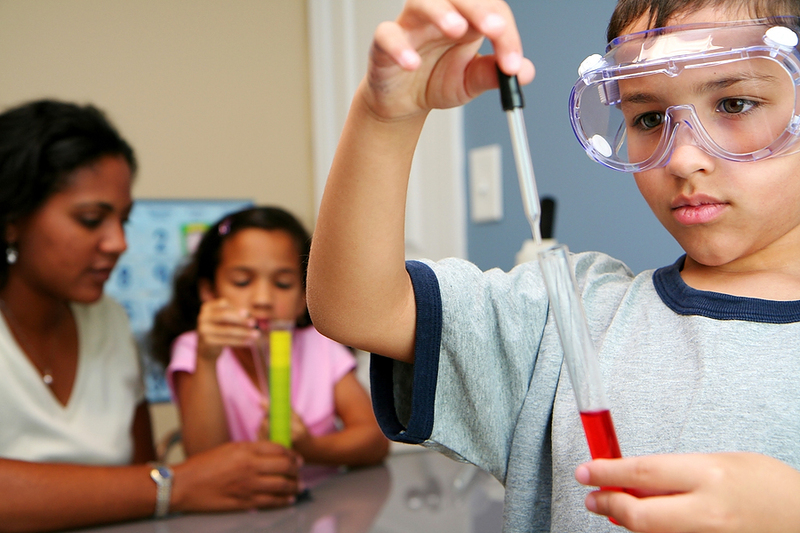 Science booklets with experiments for young children. Each one involves the senses. Elementary teachers will want this. Got a behavior problem? Behavior management expert Tom Bennett has a set of classroom resources for all types of problems you may have. Because he's from the UK, you're likely to find some fresh ideas here. Some ponderings on what makes great teaching - one of the last articles from a set of 12 I did for the Atlantic. You can mark and annotate youtube videos with a customized player to mark sections, etc. 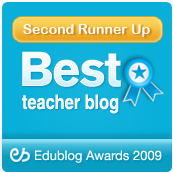 This embed plus tool is a fascinating one to use with students and in blog posts. Open source free screen recording software. I've used it in my classes as a substitute for Camtasia. Another popular certification program for teachers. A well-written article on purported "journalist" Mike Daisey who has since been disgraced when it was determined he took dramatic license to the extreme in his "reports" about Apple in China. He should have disclosed that he was dramatizing or that his monologue was inspired by true events but not that it was fact. It is interesting that I had this very same discussion with someone who writes for a major autistic organization about his refusal to disclose that he's using "gonzo journalism" in his pieces. I think that people should disclose - it is part of what an ethical writer does. In a world where you can find anyone who says anything do you know how to sort out the truth? In 3 weeks I'll be heading to the Berkman center for an Open Education Grantee meeting as a person who provides feedback to the grantees. I'm very excited to meet many of the people who have been invited but also to learn and soak in (and share) everything. With the people who will gather, certainly, there will be an impact on the open education movement. Share your best practices in the classroom 2.0 book project. Global collaboration is worth talking about. We have a weekly newsletter we've started sending through our book group with an overview of what is happening in the project. This is the same list as the book group. The Flat Classroom 15 challenges are those we use to help teachers who participate in our projects become successful global collaborators. We've used these 15 in our certification courses and are very pleased with the results. Do you want to join! Coming soon, a badge for completing these challenges -- you can be first!